Strange as it may sound, sometimes I’ve been accused of thinking too much. Sometimes that thinking takes me out of the realm of the status quo. 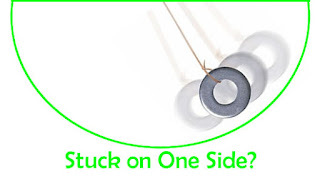 Many throughout history have also thought out of the realm of the status quo, and while that thinking may have been rejected at first, right or wrong, it has also sometimes become the accepted norm; such as the introduction of institutionalism into the faith, the Crusades, the clergy-laity divide, the Protestant Reformation, Pentecostalism, etc, etc, etc. Having said that, I guess I’m in good company. “What shall we conclude then? Is there injustice upon God’s part? Certainly not! For he says to Moses, I will have mercy on whom I will mercy and I will have compassion (pity) on whom I will have compassion. So then [God’s gift] is not a question of human will and human effort, but on God’s mercy. [It depends not on one’s own willingness nor on his strenuous exertion as in running a race, but on God’s having mercy on him]. “For the Scripture says to Pharaoh, I have raised you up for this very purpose of displaying My power in [dealing with] you, so that My name may be proclaimed the whole world over. So then He has mercy on whomever He wills (chooses) and He hardens (makes stubborn and unyielding the heart of) whomever He wills. “You will say to me, Why then does He still find fault and blame us [for sinning]? For who can resist and withstand His will? But who are you, a mere man, to criticize and contradict and answer back to God? Will what is formed say to Him that formed it, Why have you made me thus? Have we created God in our own image? What came to mind as you read the preceding verses? Did it make you want to shout a big “Amen?” Did it make you squirm as you subconsciously began to recite all sorts of seemingly opposing verses? Did it make you wonder if the Apostle Paul wasn’t speaking out of two sides of his mouth? Did you see heresy? Did you see truth? The longer I’m a Christian, the more I’m convinced that we like to think of God only in certain ways. For example, we like to think of Him only in terms of His love, which is good and right, but in the process we also reject other parts of the story, such as the preceding verses, because they somehow seem not to fit with the god we’ve created. Let’s get really controversial for a moment (and see if I cannot offend someone again). Many today seem to question the existence of hell, thinking it inconsistent with God’s love. What if hell itself was actually a very loving part of God’s creation in that through it God finally deals with the unrighteousness of man? Is this thought inconsistent with the cross of Christ? No doubt some would say so. Let’s ask ourselves a question: Would heaven be quite as glorious if all the Pharaohs and Hitlers and Stalins and Neros and Osama Bin Laden’s were all seated at the same Messianic banquet table with you and me and the rest of the Christians from throughout history? As strange as that sounds, maybe they will. Certainly the universalist would have us to believe that. But if they aren’t seated with us at the Messianic banquet, then where are they seated? Thankfully God alone decides all that. However, lest I digress too far, the point I wish to make has nothing to do with the “hell” question. I mention it simply to illustrate that, just as Paul wrote in Romans chapter nine about God showing mercy to some and not to others, there are plenty of parts in our New Testaments that will leave us squirming in our theological pews. Why? “Now we see but a poor reflection as in a mirror; then we shall see face to face. Now I know in part; then I shall know fully, even as I am fully known” (1 Corinthians 13:12; NIV). I find it audacious to think that we, mere mortal and fallible human beings, should be able to fully understand the mind of God this side of Heaven (and maybe even the other side too). And yet I’m sure that we’ve all done that a time or ten, haven’t we? From time to time we’ve all come across so sure that we’ve got God all figured out, when more than likely, all we’ve done is to create God in our own image. Ouch. No doubt some will object saying something to the effect of, “the Holy Spirit told me, or showed me that … ,” but then along come the next ten born-again and Spirit-filled Christians who also claim the same thing, and suddenly we’re faced with twelve different opinions and interpretations of the same topic. Who is right? Who is wrong? Is everyone right? Is everyone wrong? Hmm. In the end, these are just my humble musings and I really don't pretend to have an answer. Feel free to share your thoughts; I'd love to hear them. Peace & Blessings. Several years ago, I was a member of a well-known Christian motorcycle club. Actually, it didn’t really view itself as a biker club as much as a group of ministry team members to the secular biker community. As a member I wore their colors proudly. But without going into the details, let me simply say that something changed and I felt that I could no longer in good conscience support this para-church and religious biker organization. Now let’s fast-forward about twelve to fourteen years. A couple weeks ago I went on a bike ride that brought several hundred bikers together from all around the province. It was an awesome two-day event that I thoroughly enjoyed, despite the deluge of rain on the second day that created for a very wet ride home. While there mingling with the crowd, I saw members of my former bike club, albeit members of a different chapter than the one I belonged to. As I watched them, suddenly it became very apparent again why I quit that biker club. Christian ministry? Hmm. Not once did I observe them mingling with the other bikers. All I saw was them hanging around only with themselves. I remember thinking, how clique-ish of them! Whenever I saw those colors on that first day, they were only in the company of others wearing the same colors. “This is ministry to the secular biker community,” I asked myself? Christian ministry? Hmm. A caveat is in order. I noticed that one member of this club did reach out to a non-member … me. 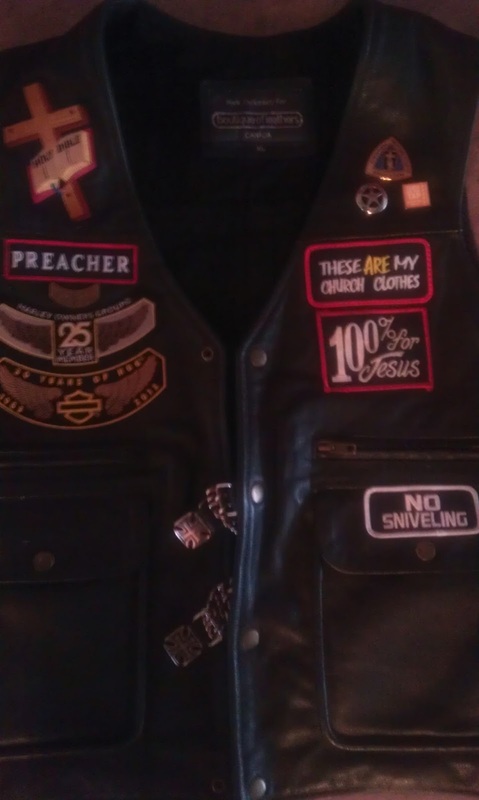 Maybe he felt safe doing so, because on my biker vest there are a couple patches that clearly identify me as a Christian. There is also a small pin with the emblem of my former association with his club. Seeing it, he asked me about which chapter I belong to. I informed him that I’m no longer a member, as I no longer wear the colors. The pin, I said, was simply a memento of those days of yesteryear. On hearing that I was no longer a member, but still wearing the pin, he said, “We’ll have to see about getting the boys to remove that pin from you!” Wow! Feeling threatened, I told him he could offer to buy it from me, and I walked away. 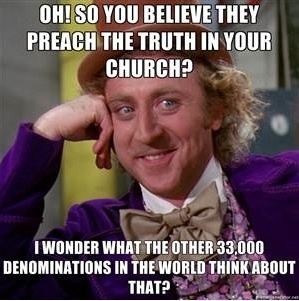 Christian ministry? Hmm. Now I said that this happened on the first day, but what about the second day? The second day they were conspicuous by their complete and total absence. It was like they never existed at all. Where were they? Was there no one there who needed to hear the Gospel on that second day of this biker rally? Christian ministry? Hmm. After the main programed events of the first day ended, many who planned to spend the night at the campsite, myself included, rode into the nearest town on a “beer run.” Whatever Christian bikers were left from this group, once the beer came out, they were gone. The thing is, nobody was obnoxious, rude, or perverted. Yes, a couple people probably had a little too much to drink, but everyone was well behaved. There wasn’t even any litter lying around, as everyone made a concerted effort to keep the place clean. But I guess the sight of beer was too much for some “Christians.” Christian ministry? Hmm. 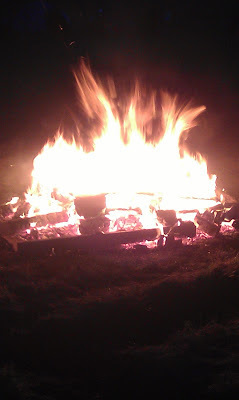 That evening, after we set up our tents, there was an awesome time around a bonfire. Talk about relaxing. It was beautiful. I mingled with other bikers, who by now obviously knew of my Christian faith (or at least suspected it), shared a couple beers, a few jokes, and made myself approachable. Christian ministry? Hmm. As I thought about my encounter with my former bike club, I tried to imagine myself as a non-believer, like many of those around me, and wondered if they perceived what I perceived of these “Christian” bikers. What did I perceive? I know this will sound harsh, but all I could think of at that time was, what a bunch of snobs! Why would anyone want what you’re selling? Christian ministry? Hmm. And now I finally remembered why I quit that Christian biker club. Christian ministry? Hmm. If that’s what it’s all about, thanks, but no thanks.